You can see everything and store more in less space. In “The Life-Changing Magic of Tidying Up,” Marie Kondo stresses vertical storage, which is so smart and simple, I can’t believe I’ve been storing my clothes and everything else horizontally and in piles. By folding shirts so they stand on end and line up neatly like Madeline and her classmates, you can see everything you have, making it quicker and easier to deicide what to wear in the morning. Marie Kondo applies this principle to all parts of the KonMari method, and it saves space. In order to see everything and have easy access to it, Marie Kondo suggests using small cardboard boxes without lids to organize your things. Again, so simple and so effective. I was surprised at how well all of our things fit neatly into old boxes we had lying around the house. By organizing by category (clothes, books, paper, Komono, and sentimental items), you get rid of more stuff and become more organized than you would if you do it room by room. You probably have similar items spread throughout your home. We did. When you declutter and organize by category, you see exactly how many pencils you have, or knitting needles or towels. When you reorganize by putting similar items together, everything is easier to find, and you realize that you don’t need everything you have. Marie Kondo makes the choice between what to keep and what to get rid of simple. Asking whether an item “sparks joy” is an easier question than whether you may or may not need something sometime in the future. Either the item makes you happy or it doesn’t. Simple. Of course, in practice, sometimes you do have to keep things that don’t spark joy (feminine hygiene products come to mind), so the first question really should be “Do I honestly needthis in the truest sense of the word ‘need’?” If the answer is no, then you can ask if it sparks joy. Cleaning is quicker. No, wait. Everything is quicker. No more pulling out the panini press to get to the toaster, balancing precarious towers of leftover containers, pulling all the towels out of the linen closet to find a washcloth, or having to clear off counters before I can scrub them. I feel like a weight has been lifted. This is so cliché, and I hate that it’s true. But having a decluttered and organized home has freed up time and emotional energy for other pursuits, ones that bring me joy and help me move closer to achieving my goals. Again, if you don’t care about having a completely tidy home, then this doesn’t apply, but I care way more than I should. I learned things about myself and my family. I learned that I’m still a bit obsessive, that my husband’s patience is not infinite, and that my daughter is happier and more creative with fewer toys, though she still has plenty of toys. I found things. Mostly, I found cash and gift cards with money still on them (Woohoo! ), but the most important things we found were photos of my daughter at my childhood home-away-from-home. I wanted to print and frame the photos for both myself and my parents, but when I went to print the photos four years ago, I couldn’t find them. I was upset, but I gave up the search. During our KonMari decluttering, I had my husband wipe all of our old electronic devices so we could send them to be recycled. Before wiping our old iPhones, my husband went through the photos stored on them and found the missing photos. I was so excited and relieved. 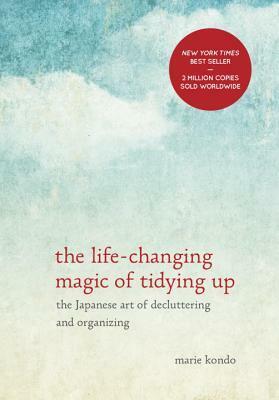 In “The Life-Changing Magic of Tidying Up,” Marie Kondo claims that many of her clients experience changes in appearance after doing the KonMari method. She says that people often lose weight or get clearer, more luminous skin. Marie Kondo attributes these physical changes to the way our living space affects our bodies and the feelings of contentment that decluttering brings. I didn’t notice any physical changes and don’t discount the idea that our living spaces can affect our bodies, but I also assume that such physical changes are, at least in part, due to the exercise. Decluttering is a workout, and it’s easier to do for an extended period of time than, say, walking on a treadmill. Since the KonMari method goes by category instead of by room, it also involves climbing a lot of stairs for many people, and stair climbing is great cardio! It’s time to address the Hexxus in the room. Neither my husband nor I are hoarders or big shoppers, but we were still storing more garbage than I’d like to admit. In “The Life-Changing Magic of Tidying Up” Marie Kondo says that the KonMari method is only meant to be done once, and she’s never had a client relapse. So, despite the initial, horrific heaps of waste there’s no need to feel guilty about it as long as you dispose of your things responsibly and commit to only bringing items into your home that bring you joy going forward. Overall the KonMari method is a simple and clever way of decluttering and organizing that anyone can follow. Marie Kondo’s book, “The Life-Changing Magic of Tidying Up” is fun and easy to read, and Marie Kondo’s passion for tidying is contagious. I was a bit skeptical of the KonMari method when I first heard about it. I certainly didn’t believe that it was life-changing. As much as it pains me to admit it, however, the KonMari method was life-changing for me, and if you choose to use the KonMari method, I hope it changes your life too.